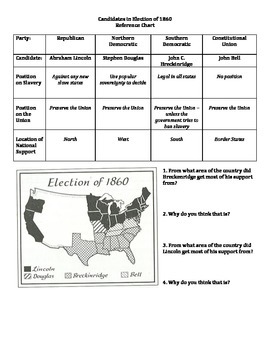 Resource includes a reference chart that outlines the four candidates in the election of 1860, their views on slavery and the union, and where their support came from. 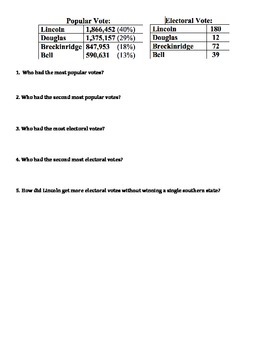 Other assignments ask students to analyze a map of the election results and the electoral results. A third assignment gives students four hypothetical Americans and asks them to predict which candidate they would vote for. The fourth assignment has students analyze imaginary reactions to the election and guess which candidate each person would have voted for and where they were from.